Petals has a great range of gift ideas for men. There are a great range of gifts from flowers to gift baskets and gift hampers that are suitable for men of all ages, hobbies and interests. The most common gift idea for men is food hampers; based on the tried and true adage that "the best way to a man's heart is via the stomach" . Food baskets can range from the sweet for the young male through snack products like potato chips, nuts and other nibbles to gourmet and unusual foods for the food faddie. Sweet tooth or gourmet connoisseur, there is a perfect gift for the special man in your life. For the male who is a wine or beer buff, we have wine hampers and beer hampers to suit all tastes and pocketbooks.For those old enough to drink wine, beer, spirts or other alcohol, we have a wide range of wine hampers, beer baskets and other gifts with wine, beer and spirits as part of the gift contents. Always keep in mind the liquor laws when sending alcohol as a gift. The law will often require an adult to sign for the gift and that the sender and the recipients must be over the legal age limit. If your man is a home handyman or keen on BBQ cooking, we also have a range of gifts that will put a smile on their face and keep them entertained for hours. Women are not the only ones who love to receive flowers, men too have an affinity for flowers and when it is sent from someone very special they become even more precious. A bunch of fresh cut flowers can impress not only a women but a man as well, as it will make him feel special. Occasions like birthdays and anniversaries are ideal for sending a bouquet of fresh flowers to your man. 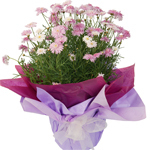 Petals has a wide range of flowers in varied designs and colours that assist you in sending the perfect bunch for him.